Oil traders are emptying one of the world’s largest crude storage facilities, located near the southernmost tip of Africa, as the physical market tightens amid booming demand and OPEC production cuts. Total SA, Vitol Group and Mercuria Energy Group Ltd. are selling crude they hoarded in Saldanha Bay, South Africa, during the 2015-2016 glut when the market effectively paid traders to store oil, according to people familiar with the matter, who asked not to be named discussing private operations. Crude demand is now seasonally outstripping supply, tightening the physical market for some crude varieties to levels not seen in the last two years and encouraging traders to sell their stored oil. “The market is selling inventories from everywhere,” Mercuria Chief Executive Officer Marco Dunand said in an interview in Geneva. 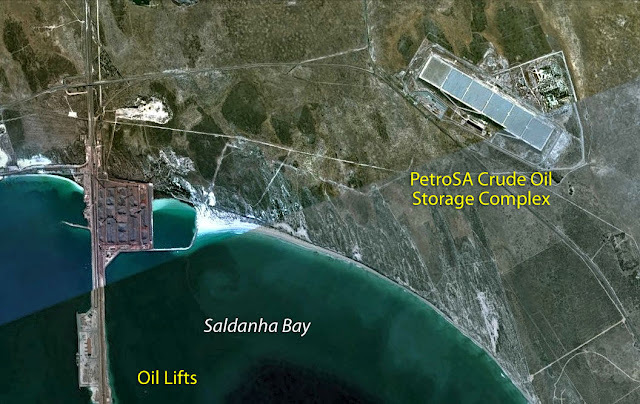 Although largely unknown outside the oil trading industry, Saldanha Bay is one of the world’s largest crude storage facilities, with the capacity to hold 45 million barrels in just six gigantic, partially-buried concrete tanks. By comparison, Cushing, the better-known U.S. oil storage center in Oklahoma that serves as the pricing point for the West Texas Intermediate oil benchmark, can hold about 75 million barrels in more than 125 tanks. Mercuria, which operates a blending operation at the South African terminal, has been offering cargoes from the facility, with China the likeliest destination, according to traders with knowledge of matter. Total has also been seeking tankers primarily to load Nigeria’s Escravos crude from its tank in Saldanha Bay. In addition, Vitol has been unwinding its crude stores at both Saldanha Bay and in northwest Europe, the traders said. Vitol and Mercuria declined to comment on their Saldanha operations. Total didn’t immediately respond to a request for comment. The structure of the Brent crude oil market has strengthened into so-called backwardation -- when near-term prices are more expensive than those in later months, indicating tighter supply. For most of 2015, 2016 and earlier this year, the Brent market was in the opposite condition, known as contango, which encourages stockpiling. Contango allows traders to buy crude, put it into storage and lock-in a profit for a future sale by hedging forward. “Backwardation is going to increase a bit,” Dunand said in the Sept. 15 interview. “We are seeing a reduction in global inventories, although we can see another build-up in the first quarter of next year,” he added. Brent futures for the nearest month have risen to a premium of about 30 cents a barrel to those the following month, meaning that timespread is in backwardation. In early July, that spread was in a contango of about 30 cents a barrel. Other key timespreads, including the price difference between the December 2017 and December 2018 contracts -- a popular yardstick for measuring market conditions -- have also moved into backwardation. The shift of the Brent curve toward backwardation is "proof that the oil market is re-balancing," said Amrita Sen, chief oil analyst at consultant Energy Aspects Ltd. in London. "Physical crude differentials are strong globally." Mercuria’s Dunand said he expects oil prices to move "in a $50-to-$60 a barrel price range" for the time being. He added that in addition to the stockpile build-up in the first quarter of next year, there could be another one in the second quarter. OPEC officials, along with other big oil producers including Russia, are gathering this week for a meeting to review progress on production curbs agreed last year. The review will help OPEC and non-OPEC oil ministers when they meet in Vienna on Nov. 30 to decide whether to extend their production cuts beyond March 2018.